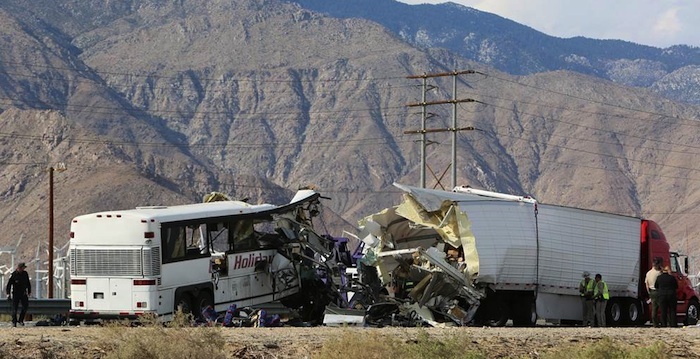 It’s been just over a year since the fatal semi-truck and tour bus crash that killed 13 people and injured 31 in the California desert and now the truck driver involved in the incident is facing a slew of charges. Bruce Guilford, 51, was recently arrested in his home state of Georgia and transported to Riverside County, CA where he is being charged with more than 40 felony and misdemeanor counts, including vehicular manslaughter. The horrific accident occurred on Oct. 23, 2016 during the dark early morning hours as a tour bus full of passengers was traveling westbound on I-10, returning to Los Angeles after a trip to a desert town casino. The bus approached a portion of the highway where traffic had just started to move again after being stopped while Southern California Edison workers pulled wires across the road. Guildford's rig had been amongst the stopped vehicles and according to investigators, he had fallen asleep in his rig with his parking brakes on while waiting for the traffic to resume. When the lanes were re-opened and the other vehicles began to move, Guildford's truck remained stopped for more than a minute as the tour bus approached from behind at 76 mph. Investigators also determined that the bus driver, Teodulo Elias Vides, was mostly at fault for failing to see the rig and react accordingly in the 20 seconds he had to respond. Instead, he crashed the tour bus into the back of rig and died instantly along with 12 passengers riding in the front rows. An earlier NTSB report revealed that Vides had slept only about four hours in the 35 hours preceding the crash and that on the day of the crash Guilford was on his second round trip delivery job from Alabama to Salinas within two weeks. According to the details of the CHP report, he had previously driven the route from Oct. 8 to Oct. 18 and then immediately departed for a second trip on Oct. 19. The CHP report then alleges that Guilford not only violated maximum driving-time regulations but also tried to hide the violations by falsifying his log records. While he was “not the party determined to be most at fault for this collision” ... the nearly nonstop driving resulted “in acute sleep deprivation” and his falling asleep behind the wheel “was a substantial factor in the deaths of 13 individuals,” said the report. Last month the NTSB also concluded that both Guildford and Vides were sleep deprived. 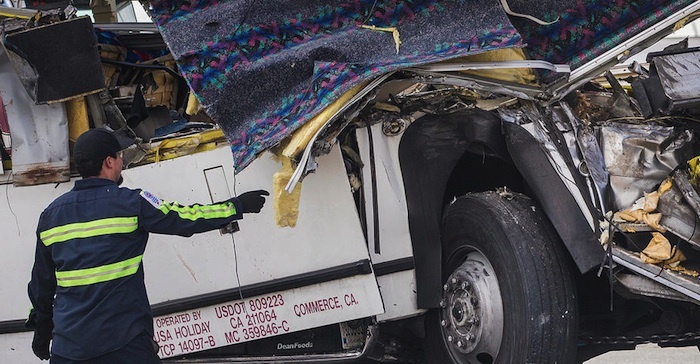 “In this crash, not one but two commercial vehicle drivers — people who drive for a living — were unable to respond appropriately to cues that other motorists did act on,” NTSB Chairman Robert L. Sumwalt said. Guilford is likely to appear in court for his arraignment on Wednesday. If he had been abiding by the hours of service regulations he wouldn't have been there to be involved in the crash. Potentially the crash wouldn't have happened if he hadn't been there. Really so very GLAD to hear that!!! So when are we going to get ALL them damn cars off the road!!?? You know the one's DRUNK,SLEEPY,OVER WORKED....PARTYED TOO HARD!!?? This is a joke right? Potentially wouldn't have happened? If it wasn't him being rear ended, it would have been whoever was in front of the truck driver. Possibly a bunch of 4 wheelers which could be just as bad if not worse. No, the truck driver was asleep in a travel lane. Cara Camarena He had been stopped for a little more than a minute, So tell me how this could have been avoided again ? READ the article. The "What ifs" seem to be in play here. "What if" the Truck Driver had been given different runs that put him the exact same place at the exact same time and his truck stalled while he was waiting in the stopped traffic and when he tried to start it, it took about a minute or so. Then he gets it rolling and the bus runs into the back end of the trailer and a dozen innocent People and a guilty Bus Driver die in the crash. Is the Truck Driver somehow no longer at fault in this case? This Truck Driver ABSOLUTELY should have been given citations for the appropriate charges dealing with his log book, but should NEVER have been charged with ANY part of the deaths of these 13 people. There really is only one reason to charge the Truck Driver Criminally, and that is to bring the Trucking Company's Insurance Company into the Liability part of this claim as the Victim's Families and their Attorney's will be compensated that much better. Sad, but true! Cara Camarena, have you ever been at a light and a car in front of you runs out of gas? This creates the same type of problem. Now, in that type of case, would the automobile driver be charged if this bus rear ended her and 13 people died? Please, I'm not kidding. In my State, it is ILLEGAL to run out of fuel in the travel lane of a public roadway, so yes, the automobile driver should be charged, but probably would not be. Sadly, this only comes down to Insurance Liability Policies and the Limits of those policies. Since Interstate Commercial Carriers are required by Federal Law to carry a minimum Liability Limit of $750,000, the reality is that most carry $1,000,000 and companies like mine carry $5,000,000. Thomas Reed it's a catch catch bro. But is true what you're saying to. But he also knew better. Ok, I’m confused how a round trip between Salinas, Ca to anywhere in Alabama in ten days is automatically over hours? MUCH of the roadway between Arizona and Texas (a majority of the trip) has relatively high speed limits. Drive six and a half days, take your 34, drive back one or two, and you should be solid on a round trip of about 4500 Miles, I’d think. It probably could've been legal, but he didn't run it legal. But you don't know what he had to start his first trip. Was he starting with a fresh 11/14/70? Wow, u can b parked and some one hits u and u get charged wtf. Cara Camarena it's a thing called "left lane". False, if the truck driver wanted to sleep, he should've been pulled way off onto the shoulder. He was asleep in a travel lane. He is at fault and even more so since his log records were falsified. Cara Camarena He could have just as easily been rearended sitting on the shoulder moron. Happens all the time. If you had any kind of experience, you'd know this. Scott Murray What's stupid about it ? Well here is a story that confirms the myths of " Vehicles that strikes other Vehicles from behind are at fault !!!" As a former Police Officer of 14 years of experience in working Traffic Accidents, I would had cited the Semi- operator as a contributor for having impeding the flow of traffic, but the Bus operator was clearly at fault for Traveling Too Fast For Conditions which this Law states that the operator has to be in control of the vehicle at all times , and based on this story I believe that the Bus Driver was at fault because apparently he/she could not see what was ahead of them prior to this very tragic accident that took the lives of 13 people. Drivers truly need to except responsibility for their actions when they take it upon themselves to violate the law of physics which tells us that, what goes up, must come down... this implies that we all wake up and we must equally rest so that we can function properly, and so in this case the driver was tried and fell asleep failed to set an alarm and or at the least have his window down so he/she could be somewhat aware of the traffic movement... Thanks for listening! It was the bus drivers falut,a stopped vehicle can't cause a wreck, I have set my brakes to take a piss in stopped traffic, and the bus driver had no business doing 75 in a 55!! That's the speed limit for cmv's in California, and traffic was stopped because of wires in the road; the bus driver should have seen sign that said road work ahead, only false log charges should be filed against the truck driver;; he did not cause the death of the people the bus driver did. Let me remind you guys who fail to realise who's at fault. There were two people at fault here. Can't just blame the truck driver. Michael DiGiovanni, what if the bus driver had gone to sleep instead of trying to maximize his pay? I thought the speed for commercial vehicles over a certain weight in the state of California didn't exceed 55 mph or are buses exempt and allowed to go 65 mph just like cars or did they up the speed limit in California? I think one has to take into consideration that a big contributing factor that the bus's driver was speeding coupled with a calamity of other errors which unfortunately led to the deaths of other people. It's like the accident a friend of mine had. She was stopped at a red light and a motorcycle rider, probably showing off for his friends, plowed into her backend. Needless to say, he went right through her rear window and wound up in her front seat. Who's at fault? They ended up giving her a ticket even though she was completely legal! It turns out that the motorcycle rider didn't even have insurance. Same thing here. What we need is the trucks to stay in the left lane by them selves and let the rest of us move on with out holding up and bunching up all the cars and that lead to trouble in most problems,,, most of these truck drivers don't belong on the road !!! OOps I meant to say the right hand lane !!! This can happen to anybody. You are driving on a congested road. Suddenly, the traffic stops. You realize it's going to take a while before traffic moves again. You want to relax, you put your brakes on and you sit and wait. And after while, you just fall asleep. Then, traffic starts moving, but you are sleeping and your vehicle looks like it is parked in the travel lame. Right there, you can get a ticket for doing thst. Nobody cares that 10 minutes ago there was bumper-to-bumper traffic and all traffic was stopped. You are now obstructing free flow of traffic because you fell asleep. Now, how fast was that bus going that the driver didn't have time to see a rig on the road ahead? What about the Southern California Edison workers that had blocked the highway? If they had not blocked the road the accident certainly would not have happened. Are they going to be charged? They are as much at fault as the truck driver.